All manuscripts submitted to the Editor are peer reviewed by recognized professionals in the field, and authors will be notified of acceptance, rejection, or need for revision. Contributors are provided with proofs and corrections must be returned as soon as possible. A separate covering letter, signed by each Author, must state that the material submitted has not been previously published, and is not under consideration (in whole or in part) elsewhere, and that it conforms with the regulations currently in force regarding research ethics. If an experiment on humans is described, a statement must be included that the work was performed in accordance with the principles of thÃ¨ 1975, revised in 2000, Declaration of Helsinki. The Authors are solely responsible for the statements made in their paper, and must specify that consent has been obtained from patients taking part in the investigations and for the reproduction of any photographs. For studies performed on laboratory animals, thÃ¨ authors must state that the relevant national laws or institutional guidelines have been adhered to. 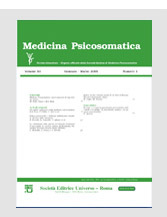 Medicina Psicosomatica publishes material in the form of editorials, articles, reviews, opinions, commentaries, clinical cases, letters, book reviews and news. A specific section of the journal is devoted to Milestones in Biomedical Research. Articles: Articles must be prepared according to specific instructions (see below). Opinions: This section of the journal publishes personal opinions of the authors in a particularly controversial area. These contributions will be reviewed as are original articles submitted for consideration. Commentaries: Commentaries refer to reports of important scientific meetings which are of particular interest to the medical community. These papers should generally include no more than 2000 words. Clinical cases: These manuscripts should include no more than 3000 words, including 3 or 4 figures and up to 20 references. Letters: Letters to the editor are welcome and will be published if appropriate. They should be titled and no more 500 words long. Manuscripts: The original by E-mail: psicosomatica@seuroma.com.  Reprints: An order form, showing cost of reprints (minimum 25 copies binding), will be sent with the galley proofs. *Copyright. To enable the publisher to disseminate the authorâ€™s work to the fullest extent, the author must sign a Copyright Transfer Agreement, transferring copyright in the article from the author to the publisher, and submit the original signed agreement.